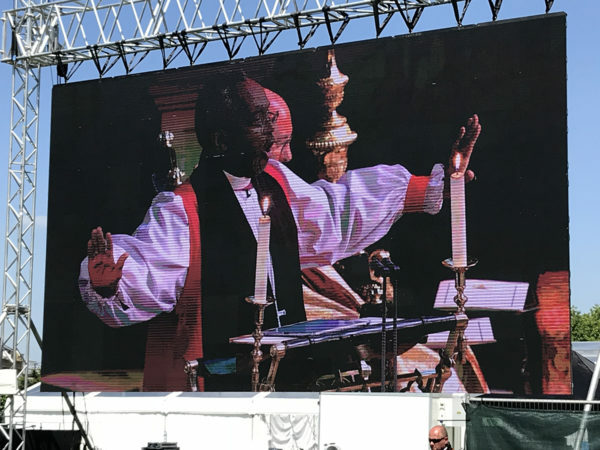 [Episcopal News Service – Windsor, England] When millions of people around the world tuned in to witness and celebrate the royal wedding of Prince Harry and American actress Meghan Markle, they were also treated to one of the most dynamic preachers the happy couple could have chosen for their nuptials. Presiding Bishop Michael Curry, the African-American leader of the U.S.-based Episcopal Church, spoke passionately for 13 minutes about the power of love. “There’s power in love. Do not underestimate it,” the presiding bishop said. “Anyone who has ever fallen in love, knows what I mean. But think about love in any form or experience of it. It actually feels good to be loved, and to express love. There is something right about it. And there’s a reason. “Love, love is the only way. There’s power in love. Don’t underestimate. Don’t even oversentimentalize it. There’s power in love. If you don’t believe me, think about a time when you first fell in love, the whole world seemed to center around you and your beloved. “There’s power in love, not in just its romantic form, but any form, in any shape of love, there’s a certain sense that when you are love and you know it, when someone cares for you and you know it. When you love and you show it, it actually feels right, there’s something right about it. And there’s a reason for it. The reason has to do with the source, we were made by a power of love and our lives were meant and are meant to be lived in that love. That’s why we are here. “Ultimately, the source of love is God himself. Where true love is found, God himself is there. … There’s power in love to help and heal when nothing else can. There’s power in love to lift up and liberate when nothing else will, there’s power in love to show us the way to live. From there, the presiding bishop referenced the Jesus Movement. He went on to talk about redemption and unselfish, sacrificial love. “It was a royal wedding today and a young couple gave their lives to each other before God and before the people of God, not just in the chapel, but throughout the world … and I thank you for your prayers for them and for your continued prayers for them and for me and for the archbishop,” said the presiding bishop in a video interview with Episcopal News Service following the service. It was a joy, he said, to see people around the country and the world “rejoicing and happy together.” Inside the chapel, guests could hear people on the outside applauding. “When the couple recited their vows literally the crowd erupted in applause. This was truly something like, something like the day of Pentecost when the Good News of Jesus was proclaimed, and people heard it in many different tongues, in many different cultures, in many different ways, and that is something to rejoice in,” said Curry. An estimated 150,000 well-wishers thronged the streets of Windsor, watching the ceremony broadcast live on their phones and large screens stationed along the whole procession route, clearly captivated by Curry’s charismatic message about Jesus’ love for the world and his words of encouragement for the newly married couple, named just before the wedding as the Duke and Duchess of Sussex. The service began at noon local time at St. George’s Chapel in Windsor Castle, 21 miles west of London. 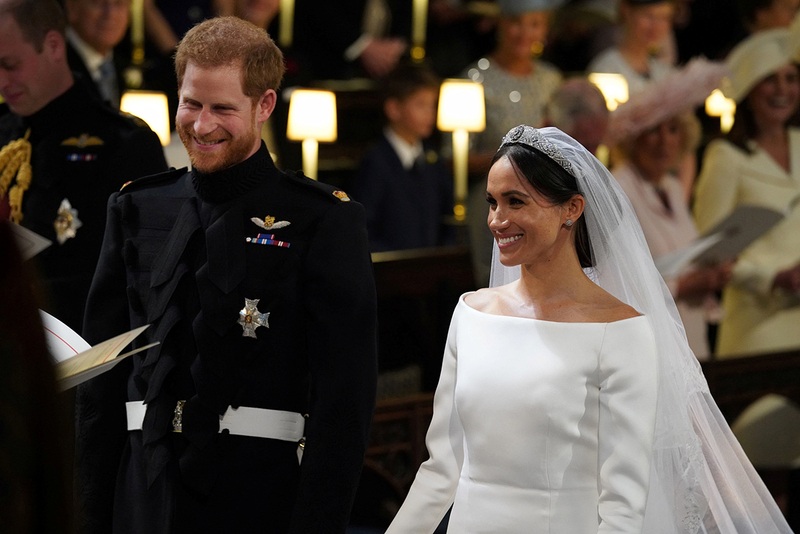 In many ways, the day’s celebrations were a typical royal display of British pageantry, but some elements, including Curry’s pivotal role and the choice of wedding cake, are a departure from tradition. Preachers at royal weddings are usually senior clergy members in the Church of England. The bride walked down the aisle to Eternal Source of Light Divine by G.F. Handel, sung by Welsh soprano Elin Manahan Thomas and was given to Prince Harry by his father, Prince Charles. The bride’s mother Doria Ragland looked on in tears. Celebrity guests included Elton John, David and Victoria Beckham, George and Amal Clooney, Serena Williams and Alexis Ohanian, Carey Mulligan and Marcus Mumford, Oprah Winfrey and Idris Elba. The bride wore a dress designed by Clare Waight Keller for Givenchy. Instead of the traditional fruitcake expected at a royal wedding, the couple selected American pastry chef Claire Ptak to create a lemon elderflower cake to incorporate the bright flavors of spring, covered with buttercream and decorated with fresh flowers. Following the service, Curry and his wife, Sharon, joined the couple and 600 other guests at St. George’s Hall in Windsor Castle for a luncheon reception hosted by Queen Elizabeth II. St. George’s Chapel has hosted royal weddings for centuries. The chapel is known as a “royal peculiar,” a place of worship that falls directly under the jurisdiction of the British monarch, rather than a bishop. The Rt. Rev. David Conner, chapel dean, conducted the May 19 service according to a 1966 version of the liturgy of matrimony from the Anglican Book of Common Prayer, while Archbishop of Canterbury Justin Welby, as head of the Church of England, presided over the royal wedding and solemnized the marriage. Markle was baptized by Welby and then confirmed in a private ceremony in March. The queen is the supreme governor of the Church of England, which is part of the Anglican Communion, and members of the royal family are expected to be active members in the church. Choral music at the service was performed by the choir of St. George’s Chapel, under the direction of James Vivian, the organist and master of the choristers. Other musicians included 19-year-old cellist Sheku Kanneh-Mason and the Kingdom Choir, a Christian gospel group conducted by Karen Gibson. The orchestra was conducted by Christopher Warren-Green and included musicians from the BBC National Orchestra of Wales, the English Chamber Orchestra and the Philharmonia Orchestra. Soprano Elin Manahan Thomas, trumpeter David Blackadder and organist Luke Bond joined the orchestra. State trumpeters drawn from all ranks of the Band of the Household Cavalry provided ceremonial support. Voices and trumpets combined to usher in the radiant bride to the majestic sounds of C. Hubert Parry’s well-known anthem, “I Was Glad,” composed for the coronation of Edward VII, Prince Harry’s great-great-great-grandfather. Hymns sung during the service included Lord of All Hopefulness and Guide Me, O Thou Great Redeemer. The order of service is here. Following the ceremony, the bride and bridegroom left Windsor Castle in an Ascot Landau carriage for a procession through the streets of Windsor. As the streets of Windsor came alive with celebrations, the royal wedding festivities stretched far beyond Windsor Castle and its surrounding areas. Anglican and Episcopal churches around the world, which trace their origins to the Church of England, also held local events and services to honor the happy couple. — Matthew Davies covered the royal wedding live. Lynette Wilson is managing editor of the Episcopal News Service. 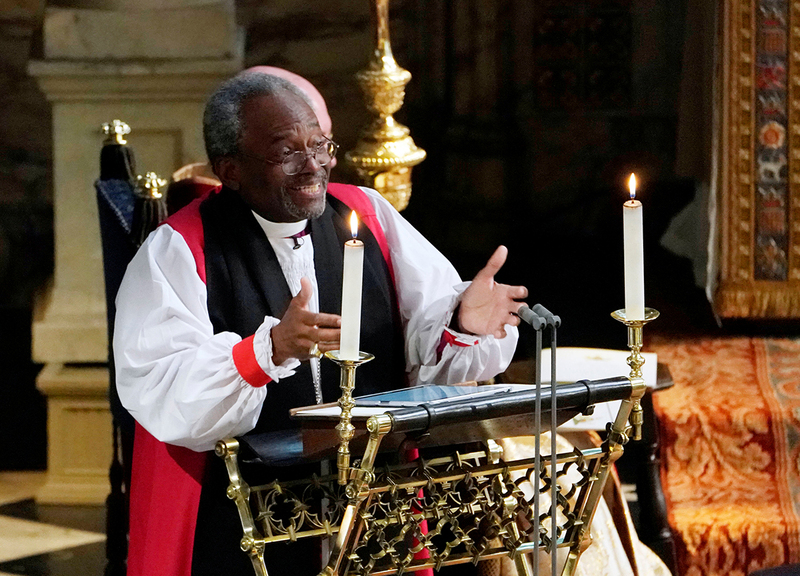 The Presiding Bishop captured so powerfully the idea that Harry and Meghan’s love can and should live in a larger frame – the faith-filled frame that says that love has the power to remake the world, to change our institutions, to make us all family. With his invoking of Dr. King and the spirituals sung by enslaved people, he placed this power of love in the context of horrific history that England and the U.S. share. I pray we will face that history and its consequences more and more. For a moment, with so many millions of eyes and ears tuned in, I felt we were all preciously held and called by his words into the collective power of that ideal of love, the possibility of it coming more fully into the public square – which I believe so many of us yearn for in our heart of hearts. Bishop Curry has stepped up the preaching game for the church. We need to reach his level! Every time I hear PB Curry speak, my soul is stirred in a wonderful way. He brought fire to the gathering and spoke truth to power. So proud of our BP, so proud of our denomination, so proud to be a Christian and a first-generation American of British descent. Bishop Curry was magnificent. That was the message for our time and for every time. Love in action is what we need. These are perilous times for democracy in this country and for those in need here and throughout the world. Sacrificial love seeking the other’s good is the agape love Jesus lived and taught. Bishop Curry gave it powerful expression in a great message of inspiration and hope. A shameful display of what Episcopal liturgy is NOT. Embarrassing. Wonderful demonstration of what Anglicanism is, & is ever more becoming. We are different. We should be different. We must be different. Bishop Curry knows this. The world is catapulting in the wrong direction. We can stop that. We are perfectly positioned to stop that. Thank you, Bishop Michael. You truly “get it”. And Meghan & Harry must get it, too, having picked you for their ceremony. Bishop Curry did us right, in my opinion. I loved his personal touches in a moment that is all too often stilted and locked in rigidity. And, if nothing else, he gave a sermon in a style that ol’ pile has *never* seen before (grin). Henry VIII was under the floor there; I wonder if he was wondering what he let loose when he split from Rome (GRIN). Bishop Curry let it shine today. May each of us carry forth that great Love of God in Jesus Christ. Thank you, Bishop Curry. Rev.Curry brought it home today succinctly in less than 20 minutes on the theme of redemptive love; while bride and groom listened, others wiggled in their seats; this was a good sign that the Spirit was there, stirring things up; thank you Rev Curry– now,each day, we each need to IMAGINE the power of love manifested in our earth as sanctuary , our homes,community, business centers and commerce…and yes at the river edge where lay down the story of war for the power of love….thank you for boldly speaking out in that context and leaving a seal upon those hearts in Windsor and hearts all over the world…. Bisop Curry made me very proud and blessed to worship as an Episcopalian and the wider Anglian community. His inclusiveness was wonderful. Entire ceremony was absolutely gorgeous, and especially perfect! I loved each and every moment! Congratulations Harry and Meghan! Ed Lane and I are the only two [so far] that think that part of Bishop Curry’s remarks were inappropriate. MLK and slavery have no part in a wedding ceremony. Love is a wonderful and great emotion; but sadly love is NOT the panacea for many ills. A fortuitous thing that Ed Lane and I are NOT speaking on college campuses, we would be tarred and feathered for our non-majority views, even though free speech is supposed to be fostered on college campuses. And what did the previous sentences have to do with the wedding? Absolutely NOTHING-just like some of Bishop Curry’s remarks had zero to do with the wedding. I read the two negative comments and have this response; I think Michael’s sermon was excellent. However, the two negative comments should remind us all that there are real people who feel marginalized for many different reasons. Michael’s sermon must also remind us that we need to learn how to reach out in love to those who feel like they are on the margins. The spirit of love must include everyone. I found the sermon inspiring. It was refreshing to see an American Bishop eschew the negativism so prevalent in proclamations coming out of the Episcopal leadership, and speak in positive terms of marriage and the power of love and compassion. Bishop Curry’s sermon got straight to the point. That Jesus Christ gave a new commandment “Love one another as I have loved you”. No difficult theologian discussion just something simple and to the point that all can understand.